Add geotags to photos shot using cameras without built-in GPS hardware. Smartphones take great pictures, and they’re also smarter than digital cameras that lack the necessary GPS hardware to record or geotag the current location as shots are taken. What if you want to add GPS information to the photos you take with higher-quality digital SLR cameras? 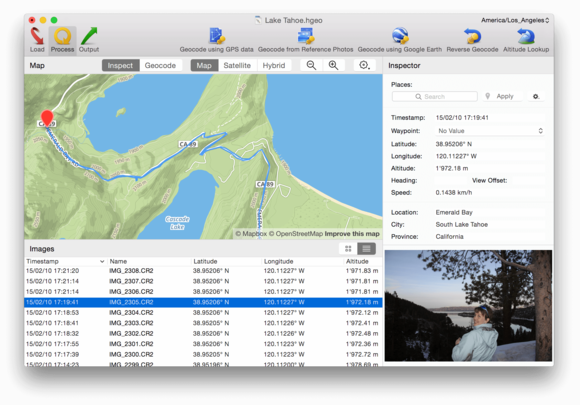 Enter HoudahGeo 5.0 ($39), a Mac application designed to add, edit, or remove GPS metadata embedded in digital photos. While you can assign a location in OS X Photos, HoudahGeo offers a more comprehensive slate of features targeted at seasoned shutterbugs, but easy enough for novices to use. Add geotag data from a GPS track logger, search for a place, or use a reference file shot at the same location on your iOS device. HoudahGeo works directly with GPS track loggers, supporting the most popular data formats including GPX and NMEA. (Houdah recommends installing the free trial to confirm compatibility with your device prior to purchase.) Photos are matched against recorded track logs and waypoints, but users can also pin the desired location on a built-in map. For consumers who don’t want to invest in a dedicated logger, HoudahGeo also matches GPS data using reference photos taken with an iPhone or iPad. After moving to each new location, grab a quick shot with your iOS device, then load photos from both cameras into the same HoudahGeo project and select Geocode from Reference Photos on the toolbar. Should you forget to make a reference photo but know where images were taken, HoudahGeo searches anywhere in the world by city name, landmark, or address. Once you have the correct latitude and longitude, automatically looking up the altitude or adding a location name are just a mouse click away. 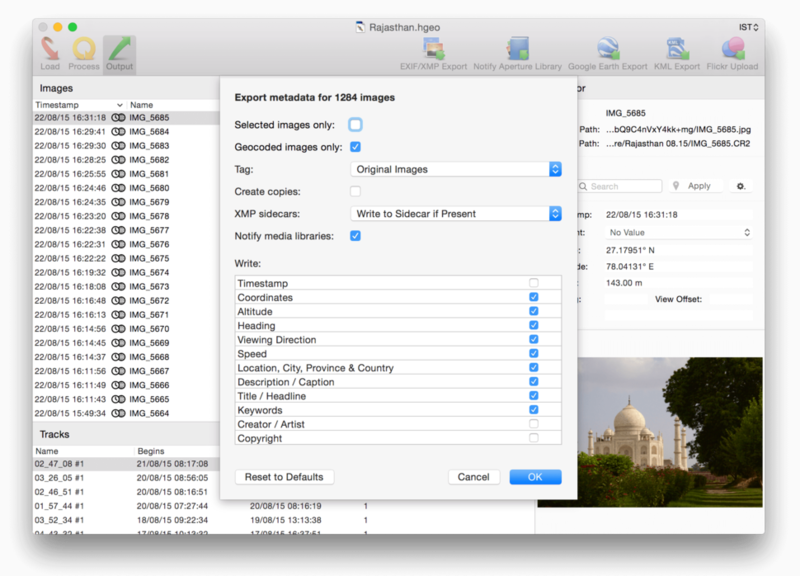 HoudahGeo 5 can import images directly from photo libraries, any folder on your Mac, or SD cards from a digital SLR camera. iPhoto, Aperture, and Adobe Lightroom libraries can be directly accessed and after editing, HoudahGeo can notify the host application that changes have been made without reimporting the image. The software writes information to JPEG or RAW image files using industry-standard EXIF, XMP, and IPTC, so metadata produced will be as usable in the future as it is today. Although you can access the OS X Photos library through the same media browser, saving updated GPS information isn’t supported; instead, Houdah recommends writing geotags before importing images to Photos. It’s not an ideal workaround, but HoudahGeo is otherwise far more resourceful than the Info panel in Apple’s own software. 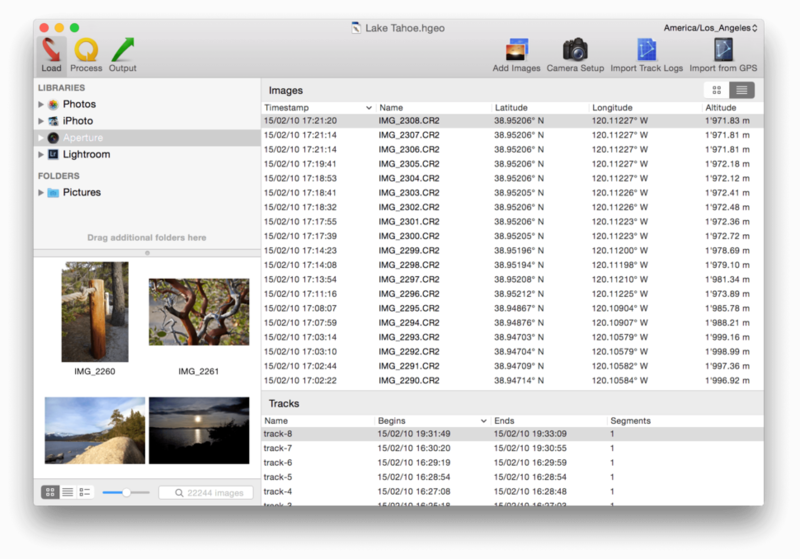 Once tagged, metadata can be added directly to your images or library, with the exception of OS X Photos. HoudahGeo 5.0 offers everything you need to geotag any digital photo, aside from the lack of full OS X Photos library support. HoudahGeo 5 allows photographers to add geotags to photos shot using cameras without built-in GPS hardware, as well as edit geographical information already stored inside your digital photos.